This blog was co-authored by Anitha Adusumilli , Principal Program Manager, Azure Networking and Sumeet Mittal, Program Manager, Azure Networking. Azure Event Hubs, a highly reliable and easily scalable data streaming platform as a service (PaaS) offering has been prolific this year with new features such as Availability Zones and a big investment into Open Source with enabling support for Apache Kafka. Azure Service Bus, a feature cloud messaging PaaS offering that also just offered support for Availability Zones has also been busy. Today, both services are announcing a public preview of Virtual Network Service Endpoints. This new feature adds to the security and control Azure customers have over their workload environments today. Now, traffic from your VNET to your Premium Service Bus namespaces and Standard or Dedicated Azure Event Hubs namespaces can be kept secure from public Internet access and completely private on the Azure backbone network. Azure Event Hubs and Service Bus are joining the growing list of Azure services that have enabled Virtual Network Service Endpoints. Offered with Dedicated and Standard Event Hubs pricing plans as well as Premium Service Bus. The feature is offered at no cost, aside from the usual Event Hubs and Service Bus costs. Available in all public Azure regions. To enable this feature you can visit the Virtual Network section of the Azure portal and add a subnet to your virtual network. 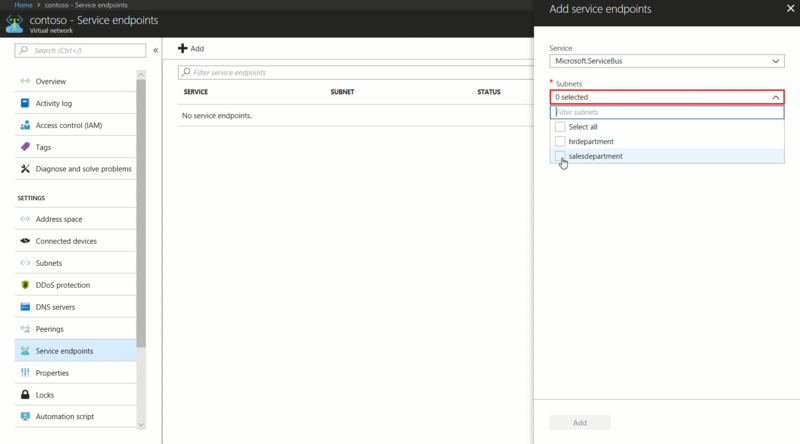 Then you can enable the Microsoft.EventHub service endpoint or the Microsoft.ServiceBus endpoint. You can also create new virtual networks and virtual network rules from the Event Hubs or Service Bus namespace overview blades. For additional information take a look at our documentation for Service Bus service endpoints and Event Hubs service endpoints.